Each of you (and others) have made and continue to make a huge difference in Megan's life. You all do more that 'just a job' - you all really care for Megan, you go 'the extra mile' each and every day, and you are all amazing. 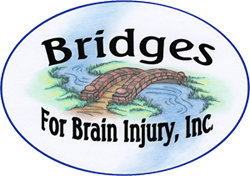 We are blessed to be able to be a part of the Bridge's family. Thank you..... I need to say it one more time: THANK YOU! I just wanted to take this opportunity to let you know how overwhelming it was to see what goes on here. The positivity, care and love that I felt coming from staff and members was truly incredible. I really can't tell you how much it meant to me to see where my mom goes during the week to a place she truly enjoys. I was moved to tears when we left that day. Thank you for what you all do here!